Bolan Lake campground can be seen as hikers approach the lookout on Bolan Mountain. From Cave Junction, drive about six miles south on Highway 199 and turn left on Waldo Road (Jefferson State Byway). Follow this paved road for 17 1/2 miles to the top of the ridge just past the California border. The road has many sharp turns. Drive cautiously. At the top of the ridge turn left on Forest Service Road 4812. This is a gravel surfaced road. Assure the tires on your vehicle are suitable for driving on this type of surface. 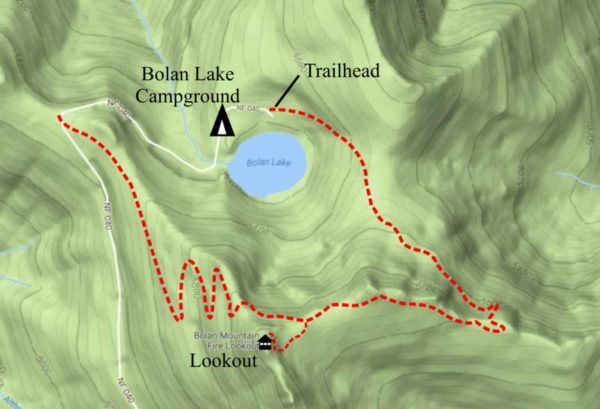 There are several roads going to the left and right in the first four miles but the road to Bolan Lake is generally the one that is most traveled. It is best to carry a Forest Service map when driving in this area. After driving four miles, you will come to a fork in the road. Go to the left at the fork and drive about two miles to another intersection. Stay to the right and drive another mile to the lake and campground. Drive through the campground and look for the trailhead on the left side of the road. The road to Bolan Lake is closed by snow during the winter and early spring. This hike takes you to a lookout tower on Bolan Mountain on a route that climbs through a forested slope to a trail junction and then follows a ridge to an access road and the lookout tower. This access road is closed to vehicle traffic except for occasional visits by Forest Service staff or by individuals who have rented the lookout for the evening. If you want to look down at the lake, you will need to walk down the road a short distance past the lookout. It is possible to continue down this road and walk back to the campground making this a nice loop hike. Bolan Lake is a popular refuge during hot summer days for both day users and campers. The lake is situated on the crest of the mountains between the Klamath River and Illinois River near to the route that gold prospector first came into Oregon and discovered gold in the valley below. The most concentrated source of gold was in Bolan Creek that originates from Bolan Lake. 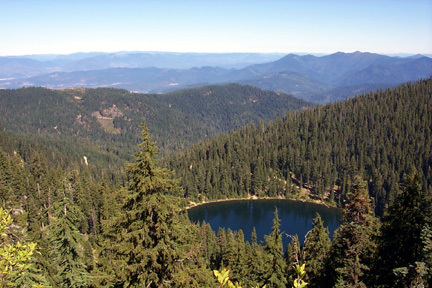 The lake is in a small basin carved out by a glacier during the last Ice Age and is surrounded by stands of Douglas fir and other trees. The trailhead begins at Bolan Lake Campground and climbs to Bolan lookout with panoramic views of the surrounding mountains. Important Note: The Forest Service rents the lookout tower. Don’t be surprised if you find a car and someone in the building.